Since Salamanca is really far west and relatively close to the Portuguese border, I wanted to make a Portugal trip happen during my two weeks in Iberia. Originally I had looked into trains to Lisbon, but it turns out that Lisbon is really far away and travel options are few. So then we checked out Porto, Portugal’s second-biggest city which is about half the distance from Salamanca, but at first it seemed like the transport options would also be undoable… the only bus on Sunday would get us back to Salamanca at 3 in the morning, basically not an option for Daniel (who had to be in class Monday morning) or for me (who was sick during the planning of the trip and thought that those hours sounded awful). Luckily, I played around with the bus website long enough to find reasonable, discounted bus trips on Thursday and Saturday, convinced Daniel to skip class on Friday, and we were off! Let me just take this opportunity to tell everyone that Porto is incredibly amazing. It might actually be my favorite city I’ve visited in Europe. 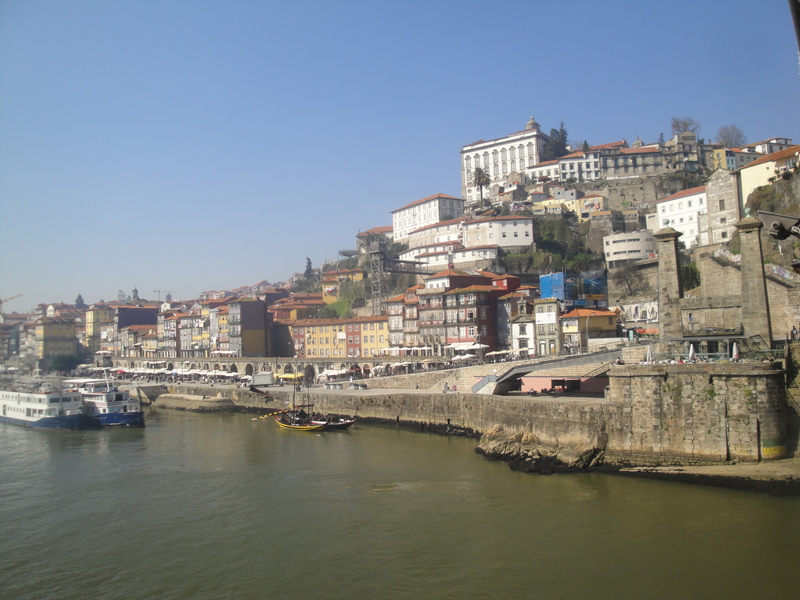 The guide on our tour on Friday laughed at us when we told him we’d chosen Porto as a fallback to Lisbon… it turns out he was justified, because our time in Porto was nothing short of fantastic. I really can’t recommend it enough. After a 6-hour bus ride, we arrived in the coastal town at about 6:30 in the evening. We were in a new country and, thanks to Francisco Franco apparently, a new time zone as well! After a little frustration, we figured out how to work the Metro system and made the way to our hostel, which was quite close to the city center and about a 10 minute walk from the river. 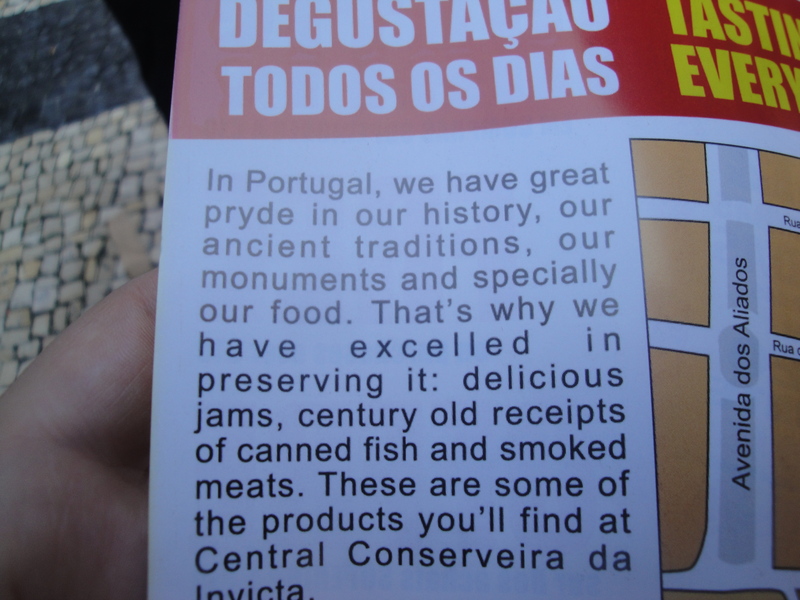 Our first evening in Porto was characterized by our new slogan, “Portugal is weird.” Starting with the language, which, when written, looks close enough to Spanish(although Daniel repeatedly expressed his frustration that they were spelling everything wrong), but when spoken, sounds almost Slavic. Don’t ask me. Thanks to some really strange street-naming and numbering systems, it took us forever to find our hostel. (When we did find it, we were incredibly impressed. We only paid 11 Euro each per night, and it was easily the nicest hostel I’ve ever stayed in.) We tried to locate a restaurant we’d found on TripAdvisor that apparently doesn’t actually exist and might have actually been a front for a drug operation, or at least that’s my theory. And we kept passing groups of university students in cloaks who appeared to be hazing other students wearing bright yellow t-shirts. It was all very strange. Eventually we found an existent, non-cartel restaurant that offered the best and cheapest food ever! I got my black bean fix without having to soak them from dry, and we had our first sangria of the trip. 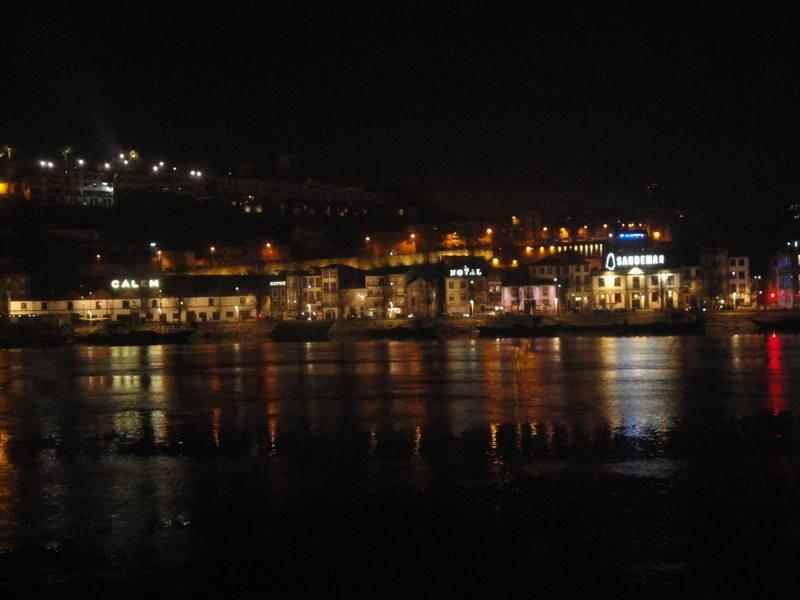 From the restaurant, we attempted to find the Ribeira strip along the river, which is designated as a UNESCO World Heritage site and is supposed to be the “must-see” attraction in Porto, but when we got there, it was all empty and didn’t appear particularly scenic to us… it turns out that, capping off our fail of a first evening in Portugal, we had been on the wrong part of the riverfront. Oops! We did admire all the huge, majestic buildings and impressive statues, and we wondered where Portugal had ever gotten the money to build them! We made our way back to the hostel and enjoyed 1-Euro glasses of port wine before bed. The wine is what makes Porto famous… port, the sweet wine people enjoy all over the world as an after-dinner treat, originates in Portugal’s Duoro region and gets its name from the city. Our entire hostel was Port wine themed, and each floor was named after a type of wine: our floor, as it would happen, was Tawny, which would come to be our favorite variety! On Friday morning, we took a free tour that lasted basically the entire morning and some of the afternoon. We got to see so much of the city and hear all about its history. 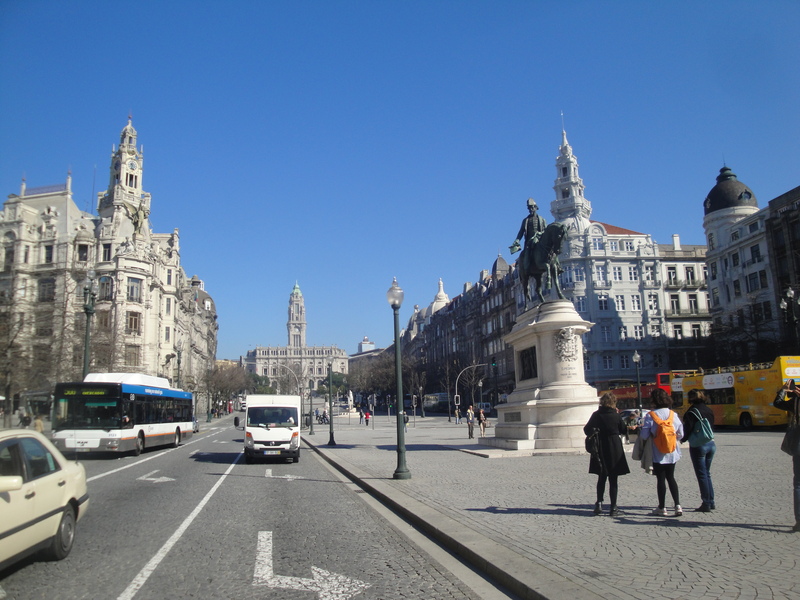 We started in the city’s center square near the glorious statue of Pedro IV and wound around the relatively small city. Our tour brought us through too many notable, interesting, beautiful, and historic places to name here, so I’ll just list the highlights. We saw the São Bento train station, which is one of the world’s most beautiful train stations but whose architect forgot to include such vital features as restrooms and a ticket office. We walked through the famous shopping district which is the home of the Majestic Café, one of the world’s most beautiful cafés. 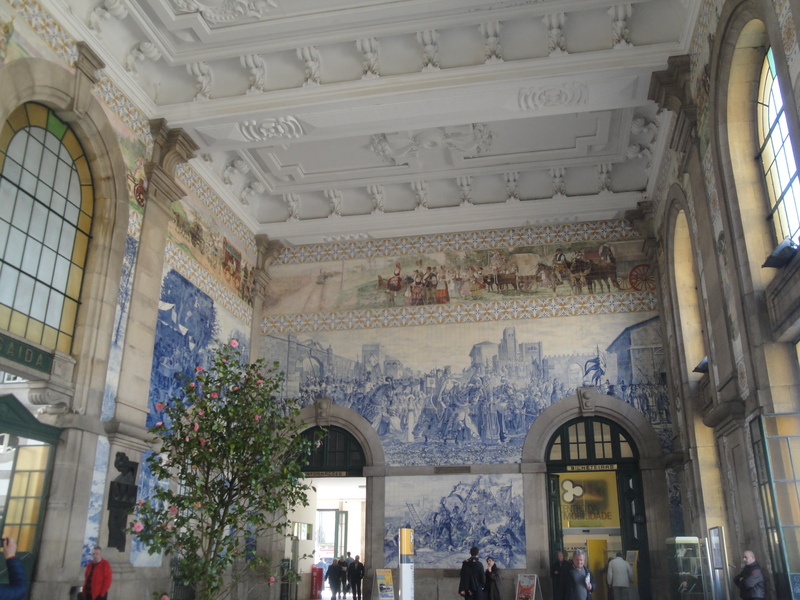 It turns out that Porto is on a lot of “World’s Most Beautiful ____” Lists… most beautiful train station, most beautiful café, most beautiful street. We learned all about the famous Francesinha sandwiches created in Porto (a ham, sausage, and steak sandwich smothered in melted cheese and a secret spicy sauce). 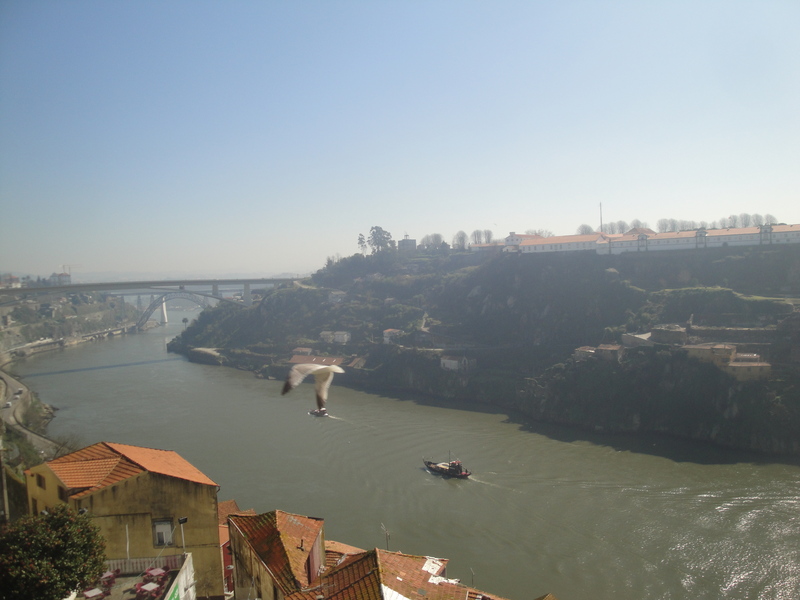 We climbed up onto the remains of the old city walls, enjoying the most gorgeous view of the city and the river, out to the ocean. We wound our way down the hill towards the river through narrow streets lined by colorful buildings, laundry hanging out people’s windows to dry, alley cats everywhere you looked. And finally we reached the Ribeira, which did not disappoint. Along the river, vendors sold their wares and people relaxed on restaurant terraces, and we had a wonderful view of the opposite side of the river, the home of the wine caves. On the buildings you can see the names of all the different port companies: Grahams, Kopke, Sandeman… Luckily, we were blessed with an absolutely beautiful day, and for the first time in 6 months, I didn’t need to wear a coat! After the tour ended, we made a few snap decisions about the rest of the day… we only had 1 full day in Porto and we wanted to experience everything! There was another, different tour from the same company that afternoon, but we also wanted to do a few wine tastings, and we debated taking the bus to an outlying fish market for dinner… how to do everything?! 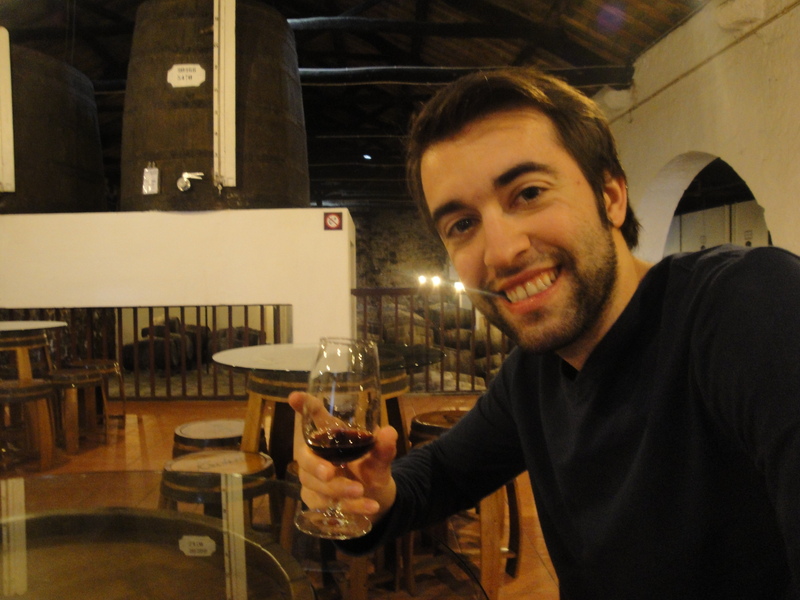 We weren’t sure if we could fit in the wine tasting before the next tour, so we decided to forego the tour in favor of more port… generally a good decision! 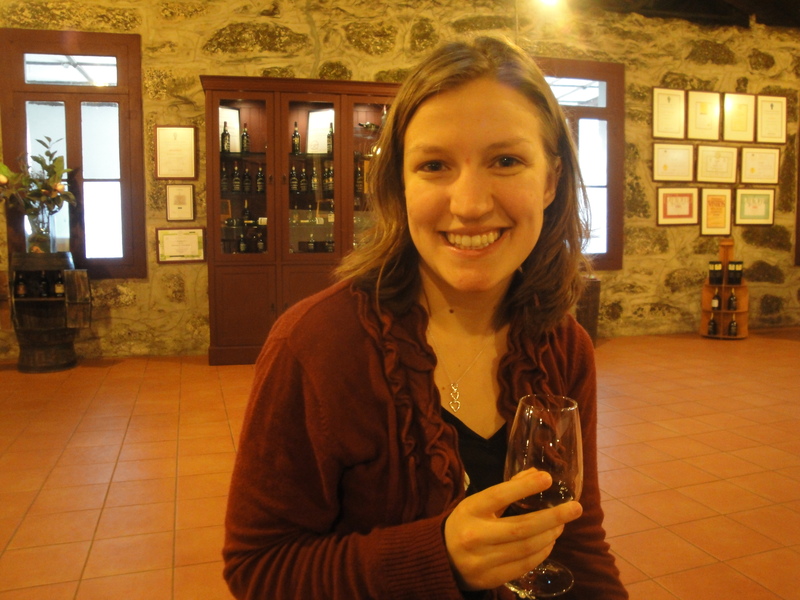 We walked across the bridge and made our way to the Krohn wine cave, which would let us taste for free! We got to sample two white wines, one sweet and one dry, and two red wines, a ruby and a tawny (our favorite). It was amazing to see all the barrels of aging wine in the cellar and hear about the different fermentation techniques and times to achieve different flavors. We compared prices at several other caves and eventually decided on Kopke, which let us sample different (quite full!) glasses of wine instead of taking a full tour. 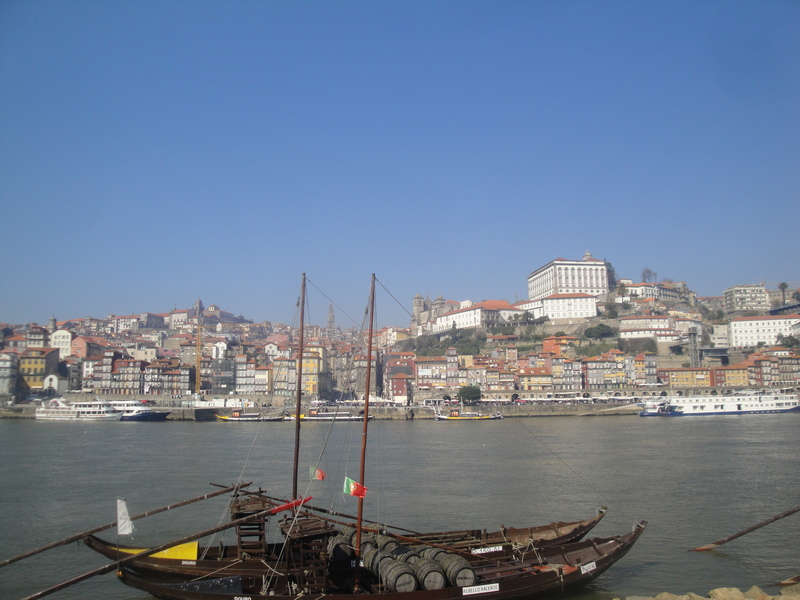 A little tipsy from the (20% alcohol) port, we returned to the Ribeira and I bought a few postcards, a must on every trip! 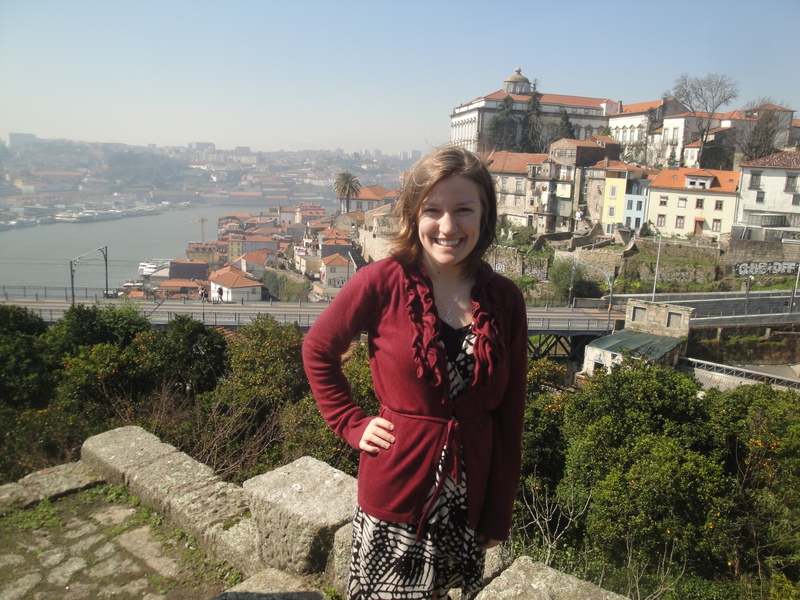 We made our way up to the Cathedral, which we hadn’t gone in on the tour, and surveyed the surrounding neighborhoods. As we wandered through the streets, we stumbled upon yet another grand view of the city. The rest of the afternoon was a hodge-podge of activity… we had missed the tour, but weren’t able to make it to the fish market, so we decided to explore more parts of the city we had learned about, but hadn’t seen, that morning. One story about Portugal’s religion and politics is manifested in the architecture of the city center: as the government started to gain power from the church, secular politicians avenged many years of church tyranny by building a grand city hall directly in front of the former cathedral, completely blocking the church from the landscape. I remembered something our tour guide had mentioned as he hyped up the afternoon tour… they would be seeing Harry Potter sites! 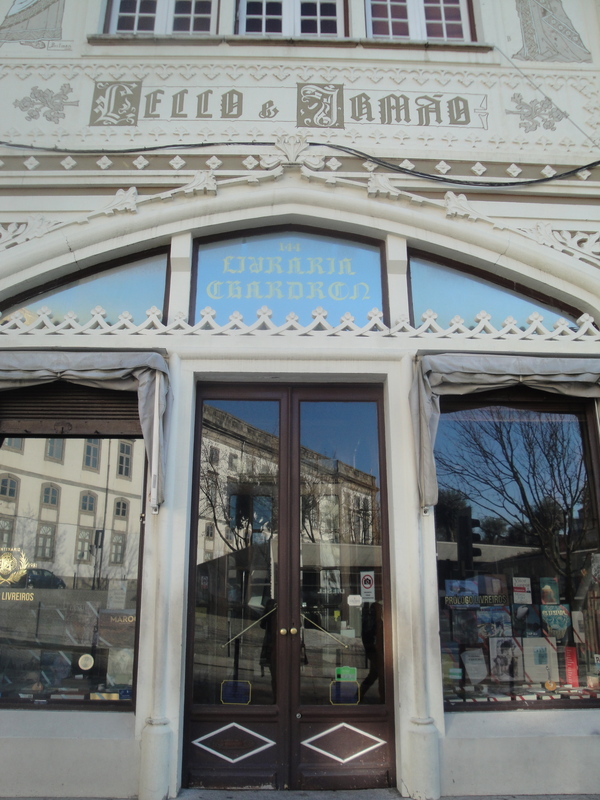 Naturally, this intrigued me, so I performed a little internet search and found that JK Rowling had been living in Porto when she wrote Harry Potter and the Philosopher’s Stone, and she had famously frequented two sites as she wrote the first book: the Majestic Café, which we’d seen on our tour, and the Livreiro Lello, an historic bookstore incredibly close to our hostel! In a feat of terrible planning, I learned this information precisely 30 minutes after the store had closed on Friday, so we planned to make a quick stop before we headed to our bus the next morning. For the rest of the evening, we wandered around the downtown area, enjoying street music and scoping out restaurants for dinner. We ended up enjoying lots of wonderful fish during our stay, which was fantastic because it was so fresh and cheap. Also because it was a Lenten Friday, as we realized once we started to make plans to try a Francesinha in all its meaty glory. We attempted to stay up until midnight to taste the delicacy, but at about 10:30 we found that we were really tired and maybe didn’t have the appetite for so much meat after all. Instead, we ended the evening the right way, with 1-Euro port at the hostel, and prepared for our departure the next morning. 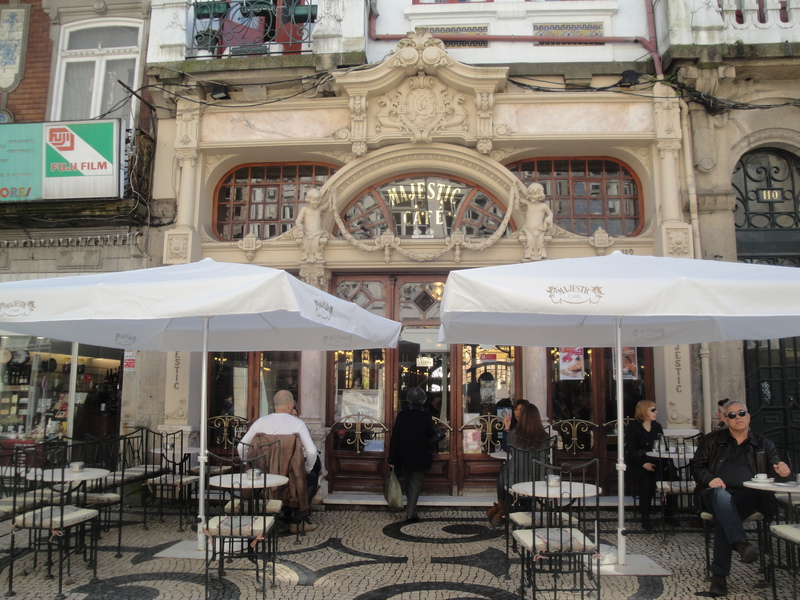 We were able to duck into the Livreiro Lello the next morning (it’s very Hogwarts, unsurprisingly), and we grabbed some pasteles de nata, a Portuguese egg-heavy pastry, on our way to the Metro stop. 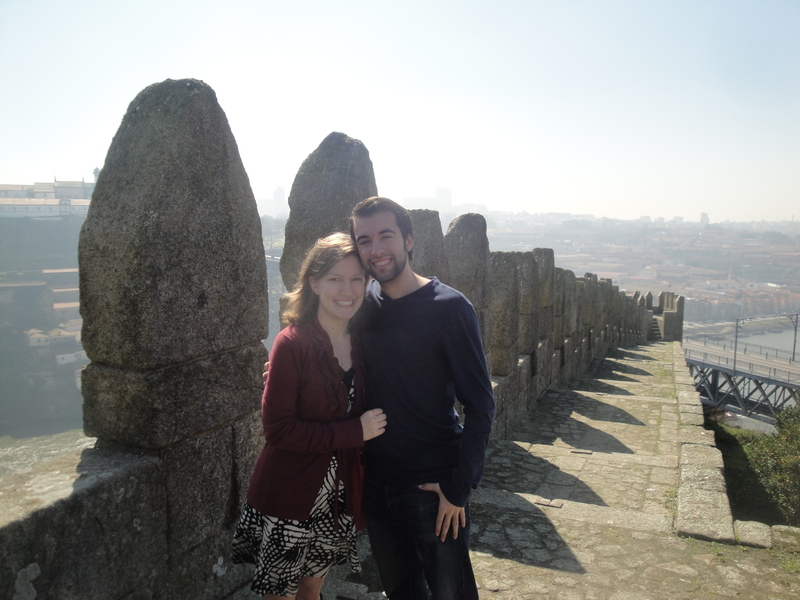 So ended our whirlwind trip to Portugal. It was wonderful. Recounting the events in writing, it maybe seems a little less impressive, but the city is just beautiful and its atmosphere is, in every sense of the word, romantic! Especially since I got to experience it with this guy. I arrived in Madrid Wednesday evening. Because I have to take a bus to Berlin when I want to fly anywhere, my travel times aren’t the most efficient, but this time it wasn’t so bad: 2 hours on a bus, 2 hours waiting in the airport, 2.5 hours in the plane. Daniel met me at the airport accompanied by his dad and his uncle, who lives in Madrid, and they drove us back to the family’s apartment. Daniel has met some of my extended family when they’ve visited Austin, and it was nice to meet some of his, even if there was somewhat of a language barrier. Because I was hungry and tired (a bad combination) after my trip, we went to dinner at about 9 pm… really early for Spaniards! 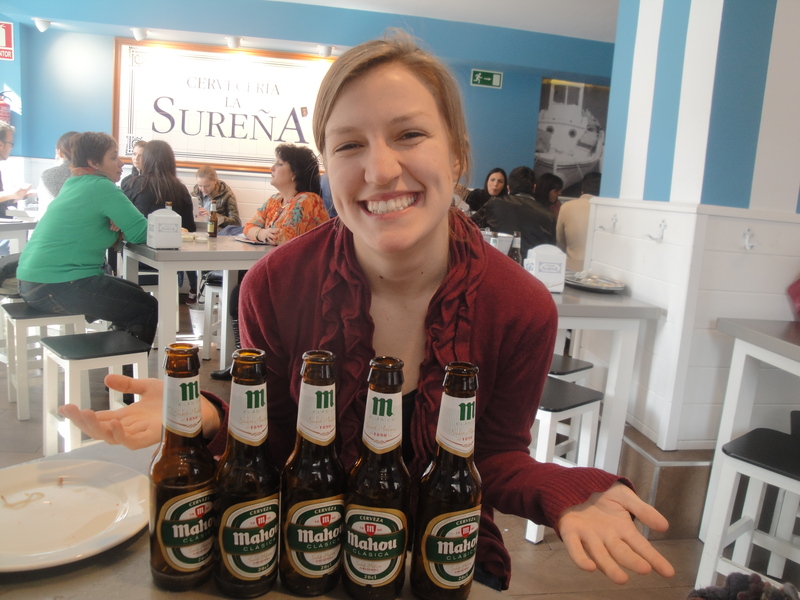 My first introduction to Spanish food was a mix-and-match meal of different sandwiches, and some really good Spanish beer. At the suggestion of Daniel’s cousin, we checked out a “free” tour on Thursday morning that took us all around old Madrid. 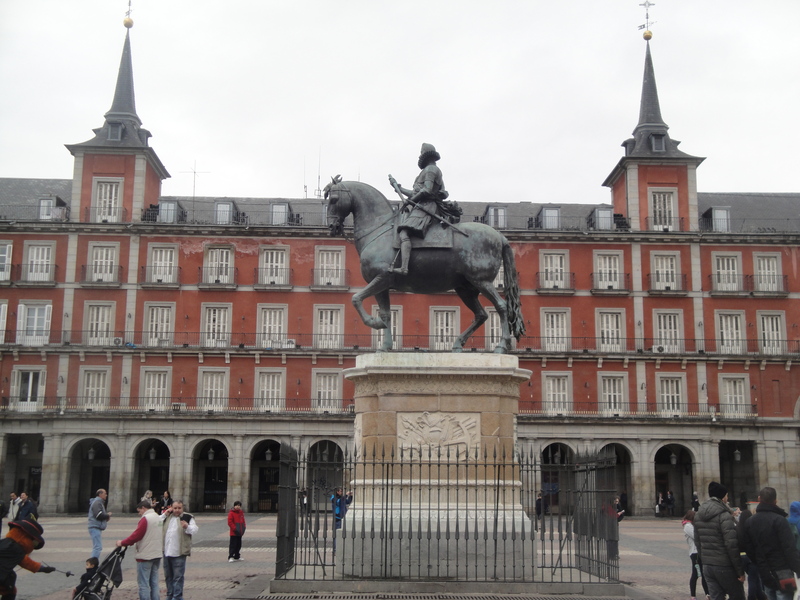 We saw the Plaza Mayor, the world’s oldest restaurant, the old city hall, the cathedral, and the royal palace, among other sights, and learned about the history of Madrid. Our tour guide was incredibly knowledgeable, and the city has a fascinating history: it has been ruled by Moors (the founders of the city), Spaniards, and a long line of Austrian Hapsburgs/Holy Roman Emperors, who were replaced by the French once they inbred themselves out of existence. After the tour, we took the Metro to the newer part of town to check out some of the city’s main streets. The city is organized in a system of streets and plazas, the largest of which is named after Columbus which contains a statue of the man himself, probably the world’s biggest Barclays bank, and a giant Spanish flag. We found a reasonably priced lunch menu near the new city hall and enjoyed some salmon (for me), veal meatballs (for Daniel), and the first of several questionable Spanish mixed salads. 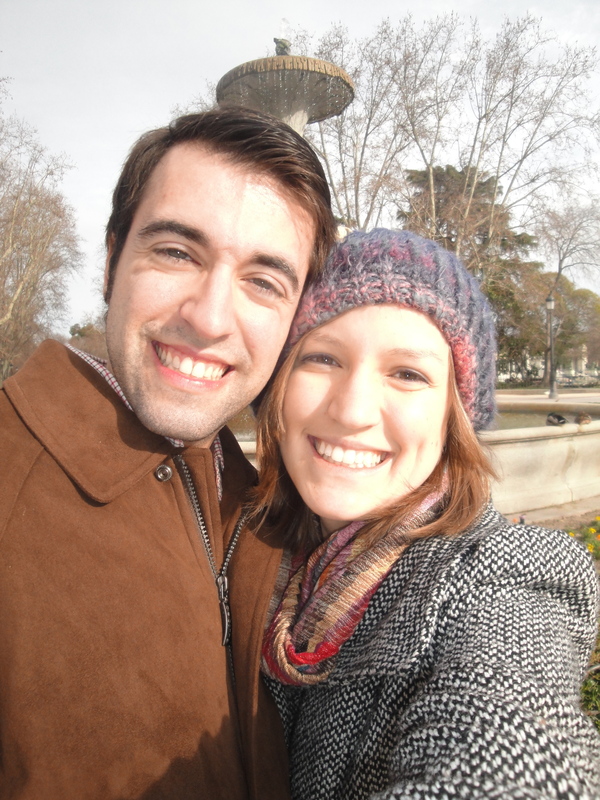 Our next stop was the Retiro Gardens, a large park in the eastern part of the city. 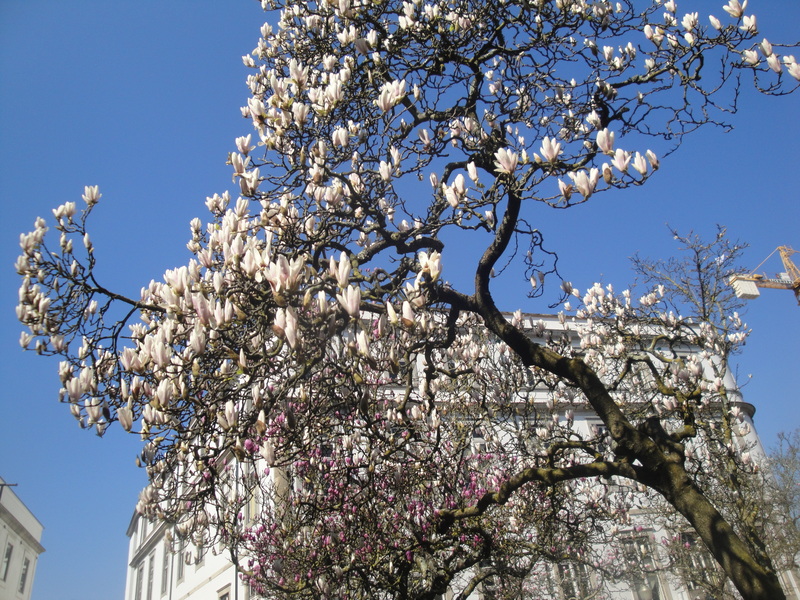 It was a really beautiful day, and we enjoyed people-watching, taking photos, and catching up with each other while the weather was nice. We had heard from our tour guide that some of the museums were free after 6:30, so we made our way to the famous Prado art museum only to learn that it would have been free all day for students. Regardless, we spent a good hour and a half admiring the work of famous Spanish artists, the most famous being El Greco, whose work was stunning in person. I am a huge fan of sacred art and loved seeing so many works depicting Biblical stories and saints. St. Sebastian is always really popular, but this time there was a lot of love for St. Bernard. Unfortunately, we had both chosen style over comfort when it came to our shoe selection that day, so we were in serious pain by this point. We staggered (after tragically getting lost to the tune of a few blocks) to the nearest Metro station, and after much complaining we made it back to the apartment mostly in one piece. We found an affordable Asian restaurant, laughed at ourselves for eating Chinese/Thai/whatever food in Madrid, enjoyed a dessert of Spanish chocolate, and watched some 30 Rock before calling it a day. Because we had seen most of the big sights on Day 1, we started the next morning by retracing a few of our steps to the opera/palace area. We said hello to our “friends”, the statues of Spanish kings that were supposed to go on the roof of the palace but are instead scattered around Spain, in this case in the park next to the palace. We took a second look at the cathedral, which is known for its architectural oddness, and took a walk across the bridge to the basilica, which we hadn’t seen on our tour. 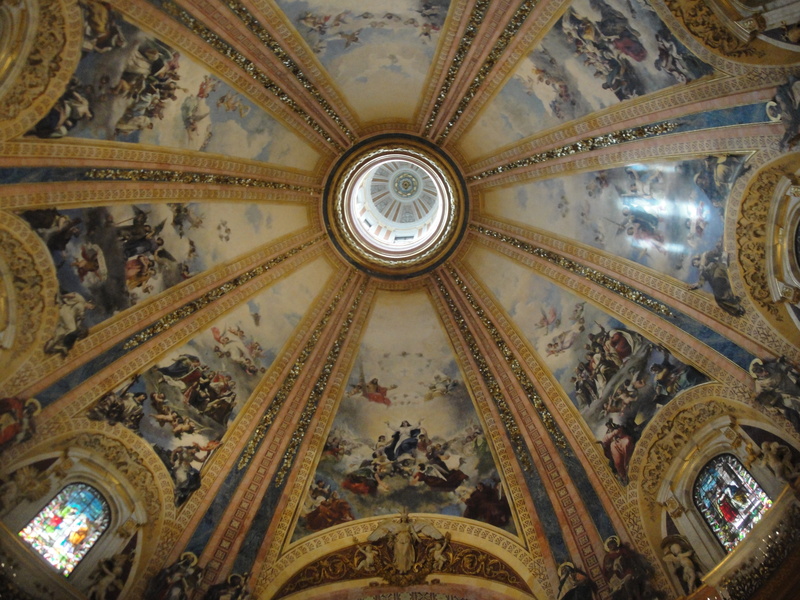 It is a giant building, and although we had to pay to go in (major European pet peeve), we also got a fantastic tour that guided us through all the side chapels and frescos. 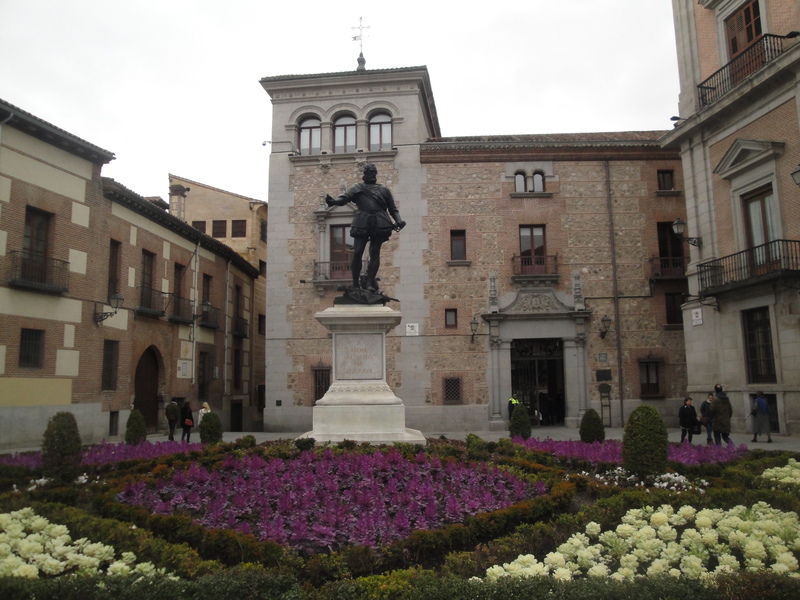 Of course, in Madrid the plazas are the points of orientation, so we headed to a major one we hadn’t seen yet. 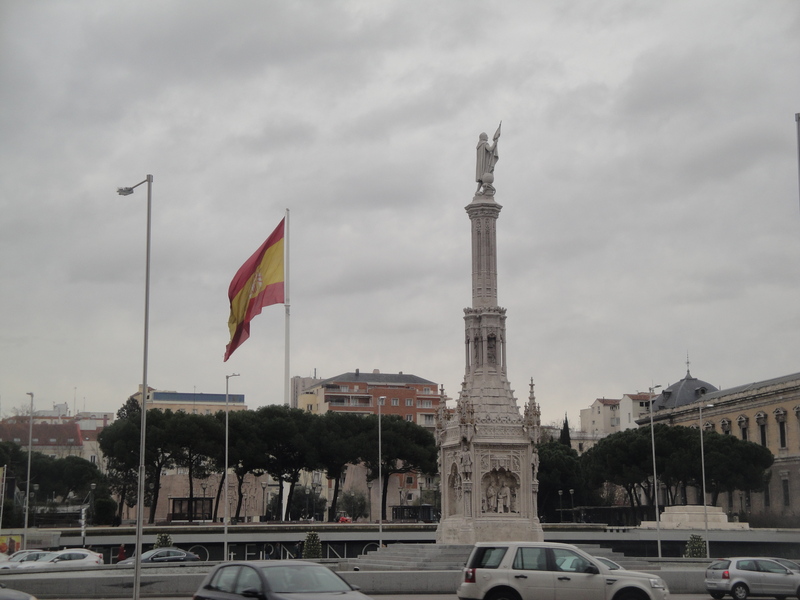 Plaza España has a huge Don Quixote statue (the pride of Spain!) and a few impressive buildings that were puzzling in that we couldn’t figure out what exactly they were. We found ourselves walking down Gran Via, literally Madrid’s main street, searching for a “very cheap” restaurant that had been recommended by Daniel’s cousin. And it did not disappoint: 5 beers for 3 Euro and enough fried food to fill both of us for a week, probably. I got to try some eels… they were okay. And of course fried calamari is always wonderful. We continued our trek down Gran Via… I bought a few postcards, we scoped out the different shops and restaurants, and we (I…) developed an insatiable appetite for ice cream. However, by the time we decided to follow through on the craving, it had been about half an hour since we had seen an actual ice cream shop, and we couldn’t agree on where we thought it had been! So we made a bet about who would be right and split up in search of the alleged ice cream. I ended up having to buy Daniel’s ice cream because I was wrong, but it was worth it because it was delicious. One really interesting thing about Madrid is how unimpressive it is. Don’t mistake that for discontent with the trip… Madrid really is a charming town, but it is not a European capital on the level of London, Berlin, Paris, or Vienna. It started as a fortress protecting nearby Toledo, and even once the Spanish empire became incredibly rich, most of the fortunes were funneled into Toledo and Seville. For my purposes, it ended up being good that Madrid isn’t a gigantic, bustling metropolis, because on Saturday morning we departed for Salamanca!